It used to be that if you wanted to watch ESPN, you had to subscribe to a traditional cable package. The same was true for people that wanted to watch live broadcasts on networks such as AMC, TNT, or FX. Then in early 2015, Sling TV was released, finally offering users a legal (RIP, Aereo) way to access cable networks without the hassle of a cable box or subscription contract. PlayStation Vue followed a few months later with a similar service (but with more channels), and in the last year, we’ve seen other streaming TV bundles from DirecTV Now and YouTube TV. Hulu’s entry to the live TV game comes after nearly a decade of letting people watch reruns of old TV shows, recent episodes of current programs, and various movies. The unique approach that Hulu brings that the other services don’t is that subscribers have access not just to live content, but the broader Hulu experience, which includes original series like The Handmaid’s Tale, and exclusive deals for shows such as This Is Us. The service is in beta right now and for $40 a month, offers access to more than 50 channels. The channel lineup has most of the big players, including ABC, CBS, NBC, Fox, ESPN, CNN, Cartoon Network, FX, and more. It does not have any of the Viacom networks (MTV, Nickelodeon, Comedy Central), thanks to Viacom’s general hatred of these services. Nor does it have stuff from Discovery Communications (Discovery, TLC). Most notably, it doesn’t have access to the channels from AMC Networks, which includes AMC, BBC America, and IFC. AMC is home to The Walking Dead, the biggest hit on TV, so its absence is curious (AMC is available on every other online streaming platform, so we’re not sure why Hulu and AMC are fighting), and for some users, could be a deal breaker. Lack of AMC aside, I think the rest of the lineup is quite good and compares favorably with the channel offerings from PlayStation Vue or YouTube TV. The one caveat is that when it comes to local channels, live access will depend on where you live. If you’re in a major market like New York or Los Angeles, you’ll get access to your local ABC, NBC, CBS, and Fox stuff. But if you’re in a market like Seattle, you’ll have to rely on on-demand versions of primetime shows on those networks. Watching “Dawson’s Creek” reruns on live TV on the Apple TV in 2017. Hulu with Live TV has excellent stream quality. Sling TV still struggles from time to time with live TV streams, and DirecTV Now didn’t make a great first impression on us either. Yet I had no problem accessing live streams and flipping between them on any of the platforms Hulu supports. Do note that as of this writing, you cannot watch live TV in a web browser—you must use an app or one of the support TV devices. For what it’s worth, Hulu says only 9 percent of its viewers watch TV in a browser anyway. Aside from all the channels and the live streams, the part of the Hulu Live TV experience that will probably get the most scrutiny is the user interface. Hulu has completely redesigned how its apps look and feel. Looking through Twitter, plenty of users hate the new interface, which is available on Apple TV (fourth generation), Xbox One, Chromecast, as well as on Android and iOS via a new Hulu with Live TV app. 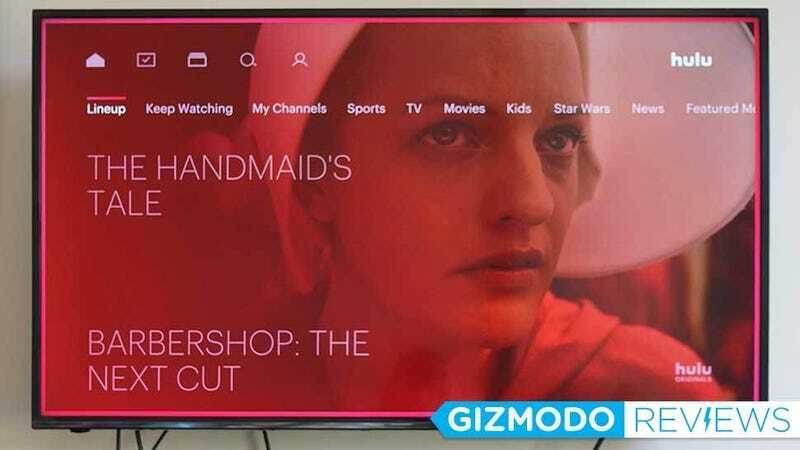 The interface is beautiful, but a total departure from the Hulu we’ve known in the past. That’s not always a good thing. Visually, I think the new interface looks fantastic. It’s clean and modern. The problem is that actually using the interface is much more cumbersome than it should be, particularly when navigated with a traditional remote. I tested the Hulu with Live TV service on Android, iPhone, iPad, Apple TV, and the Xbox One. Despite looking nearly identical, the Xbox One experience is better because the controller’s additional buttons make it easier to navigate. Though Hulu isn’t the only service with user interface issues. With the exception of YouTube TV, none of these services have a spectacular UI. PlayStation Vue’s interface has dramatically improved since I first used it (it’s obviously best on a PS4), but DirecTV Now and Sling TV are both clunky in ways I really wish they weren’t. That said, there are still plenty of frustrations with Hulu’s new interface that I hope Hulu will continue to work out. Chief among them? It’s difficult to actually find live TV. There’s no button or section for it! The closest you can do for that is to go to the “Browse” section and go to “Networks” to see what is playing live. For such a marquee feature it feels awfully hidden away. Finding what’s airing on live TV is a lot more complicated than it should be. Just give us a button! From a philosophical perspective, Hulu wants to keep all your shows, whether they aired on live TV or are from the catalog, in one place. Back in January, Hulu told me that it designed its live TV service for existing Hulu subscribers first. Yet now Hulu is faced with a challenge. It has to teach those subscribers a brand new interface that has substantially changed from how they’ve been accessing content for years. I didn’t find the UI intuitive. Instead I found myself relying on the search feature, A LOT, just to find stuff that would usually show up on my dashboard. I’m willing to give Hulu some time to sort out the problems (this is a beta, after all), but right now, the user experience changes aren’t for the better. All of your TV shows, whether you record them or simply add them to your library, are available in one library. Besides a radical redesign and live viewing options, Hulu with Live TV has a built-in DVR. The base package offers 50 hours of recordings, and for another $15 a month you can upgrade to 200 hours of recording and record from multiple sources at once. I definitely prefer the DVR experience that YouTube TV offers (YouTube TV also has unlimited sources and recordings as part of the $35 a month price), but Hulu’s is easy enough to use. One frustrating feature is that it doesn’t appear possible to set a recording for all episodes of certain shows. For instance, I just discovered that ER, one of my favorite TV shows of all time, airs in reruns for three hours a day on PopTV. I would love to just have Hulu record every ER episode for me, automatically. Unless I’m missing something with the settings, that’s not possible. I can, however, record every episode of Blackish or other series that are not in reruns. I can also rewind episodes airing live. You can even rewind them if you’ve tuned in after they’ve started. That’s nice if you’re a few minutes late to reaching the channel, but it’s a limited feature that applies to only some channels. Still, despite some of the frustrations with the user interface, I really like Hulu with Live TV. As a longtime Hulu subscriber, this gives me all the subscription content I’ve come to enjoy (which is especially important as Netflix continues to let content deals lapse in its push for original movies and TV shows), as well as access to live TV. No fiddling with an additional app like Youtube TV or PS Vue. For $40 a month, Hulu’s live TV won’t be cheaper than cable for some users—particularly The Walking Dead fans, but it does offer a more flexible alternative. For people that already subscribe to Hulu who are considering cutting the cord entirely, Hulu with Live TV is a great choice. The fusion of live programming and catalog comment feels like the sweet spot for an online TV service. At $40 a month ($44 if you get the “no ad” plan), this may or may not be cheaper than getting cable. Still, the price/channel ratio is inline/competitive with offerings from the other services. You need an Xbox One, Apple TV (4th gen), Chromecast, iOS, or Android device to watch Hulu with Live right now. Support for Roku, Fire TV, Samsung TVs, and the web are coming soon. You’re limited to two simultaneous streams at once unless you pay an extra $15 for the “Unlimited Screens” package. That package will allow for unlimited streams on your home network and up to three streams on mobile devices when you are outside the home. The user interface looks beautiful but can be difficult to navigate. It’s easier on the Xbox One (more buttons for shortcuts) than it is on the Apple TV, but finding your way around can feel more complicated than it should. The live streaming quality is excellent across devices.